Dimensions 1.16 by 6 by 9 in. Amazon.com description: Product Description: This re-print of Charles Darwin's 1859 publication of âOn The Origin of Speciesâ has been carefully formatted to improve readability and to ensure that the page numbers match, as closely as possible, the original table of contents and index for quick referencing and scholarly quotation of the authorâs âFirst Editionâ. About: On the Origin of SpeciesOr the Preservation of Favoured Races in the Struggle for LifeBy Charles DarwinOn the Origin of Species, published on 24 November 1859, is a work of scientific literature by Charles Darwin which is considered to be the foundation of evolutionary biology. 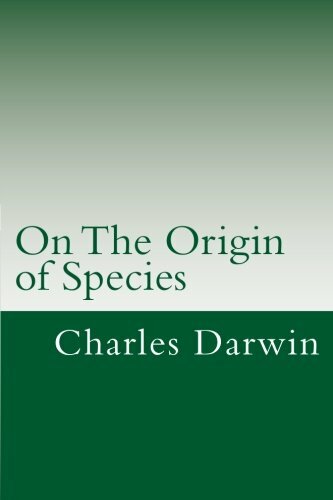 About: This re-print of Charles Darwin's 1859 publication of “On The Origin of Species” has been carefully formatted to improve readability and to ensure that the page numbers match, as closely as possible, the original table of contents and index for quick referencing and scholarly quotation of the author‘s ‘First Edition’. About: This work of scientific literature is generally considered to be the foundation of evolutionary biology. from Createspace Independent Pub (June 3, 2014); titled "On the Origin of Species: Or the Preservation of Favoured Races in the Struggle for Life." About: On the Origin of Species Or the Preservation of Favoured Races in The Struggle for Life On the Origin of Species, published on 24 November 1859, is a work of scientific literature by Charles Darwin which is considered to be the foundation of evolutionary biology. About: Charles Robert Darwin, FRS (12 February 1809 – 19 April 1882) was an English naturalist. About: Darwin turned wholeheartedly to the problem of evolution.